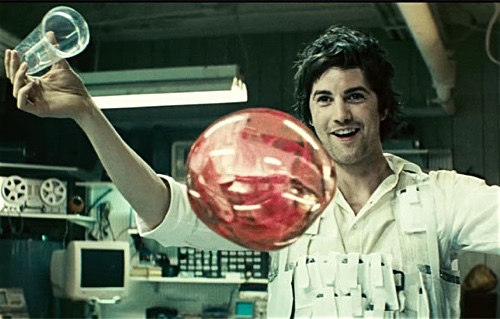 A decade since they last saw each other, Adam (Jim Sturgess) learns that Eden (Kirsten Dunst) is an employee of Transworld, a company that specializes in research and development and serves as a hub for the twin planets of opposing gravities. Adam lives on a planet called Down Below, widely known as home of the poor and the hopeless, while Eden resides Up Top where skyscrapers glisten and the future is bright. It is considered illegal for anyone to cross between worlds. However, Adam cannot help how he feels so he goes through seemingly insurmountable roadblocks just to get to Eden. His love for her is so strong that, when they do meet, he does not appear at all fazed by the fact that she has no memory of him. Visually arresting and its unique universe filled with possible surprising complications, it is most frustrating that “Upside Down,” written and directed by Juan Diego Solanas, does not strive to be a great movie—one that will be remembered by future generations. It seems content in telling a sappy romance picture with enveloping science fiction elements. In some ways, it delivers and yet in many ways, it is excruciatingly short-sighted. Watching the film is like looking inside a gigantic snow globe with multiple kaleidoscopes dancing in unsteady rhythm; there is always something to look at. For instance, it is fascinating and creepy that in their worlds, since the planets are right next to one another, there is no open sky. A character looks up and what he sees is a metropolis; it might very well be that someone is looking back in his direction at that precise moment. I wondered if they knew what a star was or if they ever wondered about foreign worlds outside their own geographically-dependent class system. While the screenplay does a solid job contrasting Up Top and Down Below, their disparities are only painted on a superficial level. Up Top has spacious environs and its denizens are professionally clothed. Meanwhile, Down Below is covered in trash, the buildings appear dilapidated, and people’s clothing seem secondhand. When it comes to feelings, there is a lack of complexity. Surely there are people Down Below who are happy and content. Likewise, certainly not everyone Up Top are well-to-do. The two worlds are established visually but they do not feel or come across realistic within the context of a futuristic science-fiction feature. There is a disconnect. The romance between Eden and Adam, though not sharply written, is tolerable mainly because of the performances. Sturgess—with his perfectly disheveled hair—is charming as usual, but Dunst surprised me. Usually, even though she is very beautiful, I find her so cold on the outside that whenever her character is supposed to be feeling sad or tormented, I often detect a fit of forced histrionics as opposed to her acting natural. Here, playing an amnesiac works for her. Those eyes look like they are constantly searching for something. She portrays a softness here that I would like to see more. If I were evaluating strictly on style, “Upside Down” would pass with flying colors. But substance is and made relevant by the writer-director’s decision to introduce the idea of love and soul mates. There is not enough depth in Adam and Eden to create a love story worthy of critical thinking and emotional investment.